I'm not a great 'Club' person but I've been a member of the National Mullet Club for many years. To be honest I'm not a very active member although if they ask me to write to my MP about a conservation issue or to give them a talk about fishing I always try to oblige. Every year the NMC hold a number of 'Fish Ins' at different venues and recently they came down to my neck of the woods for a dabble. In the daytime they had fished Poole Harbour and apparently caught a few fish. Then, in the evening, they came to Purbeck for a try at the surface maggot-feeders. As it happened the conditions were not ideal - always a problem with trips organised months in advance. My pal Phil had made the arrangements and although he'd picked an excellent evening tide it had turned out to be one of those weeks when the fish just didn't oblige. We trudged along to a weed strewn stretch of beach and strung ourselves out along the shoreline but there was not much sign of fish apart from a few surface swirlers a fair way out. 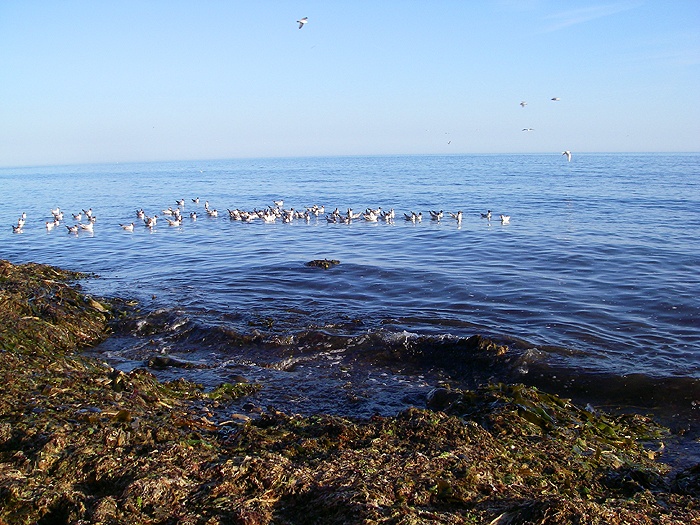 The gulls turned up in force to feed on the maggots but the mullet were thin on the ground. My good friend David, who had arrived hours before the rest of us, had already managed a reasonable fish on float fished bread before the rest of us got there so at least there was promise of some action (to be honest some of the lads could catch mullet from a tin bath if they had to). Fly fishing, which a couple of us were geared up for, seemed to be out of the question because the fish were so few and far between so most people tried various 'bread tactics'. Nick who walked along with me had seen a few fish moving and decided to stop and try for them while I plodded on to join the others. It was a beautiful evening, calm and sunny with only a slight breeze, so it was quite easy fishing apart from lots of loose weed in the margins. After a while I decided to walk back and see how Nick was faring only to find him playing a nice fish. He'd been using a controller with a longish trace and a hook baited with crust and the fish had, apparently, taken him by surprise because he never saw it take. 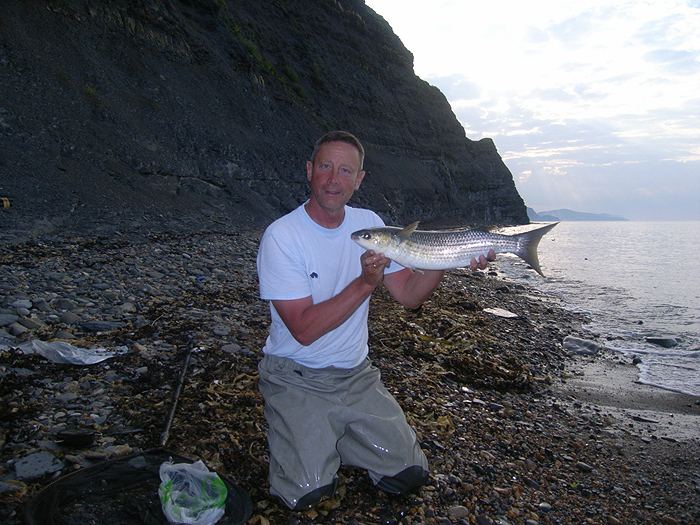 Typically the mullet put up a spirited scrap on the lightish gear and since it was his first Purbeck mullet he was determined not to lose it. By now two of the other Club members had arrived and stopped to watch the action. I picked up Nick's net and waited knee deep in the water. The first real action was when I tripped over a rock, fell into the sea and soaked my sleeve up to the armpit. Trying to recover my dignity I picked up the net and continued to wait for the fish to tire. By now little bits of green, slimy weed had gathered on the line and were threatening to jam in the tiny tip ring of the float rod. At Nick's request I picked the strands off the braid, a bit at a time, to make sure that all was clear for when the fish came closer. After a prolonged battle the mullet slid over the rim of the net and we had it. Wonderful stuff! Nick allowed his captive a little time to recover before unhooking it and having his picture taken. The fish weighed in at about five-and-a-quarter pounds. He said that the fight had been an epic compared to many that he'd had in other venues with similar specimens. Perhaps something to do with the open shore conditions and shallow water? I walked back to the others to see how they were doing but apparently it was still quiet - only the odd bite and little surface activity. After a while Nick came to tell us that he'd hooked another decent fish but this time the weed had jammed in the tip ring and resulted in a broken rod - what a downer. At this point I opted to give it best and leave the others to their fishing. However, on the way back I noticed some school bass feeding on the drifting maggots and called one of the lads to give them a try. Sure enough before long he landed a schoolie on float fished maggot. All in all it could have been more productive but everyone seemed to have enjoyed their trip (hot sun, calm sea and a few fish what's not to enjoy???). I expect they'll be back for another go before long.